May 9 - Available again! April 13 - Wohooo awesome freebie coming your way! 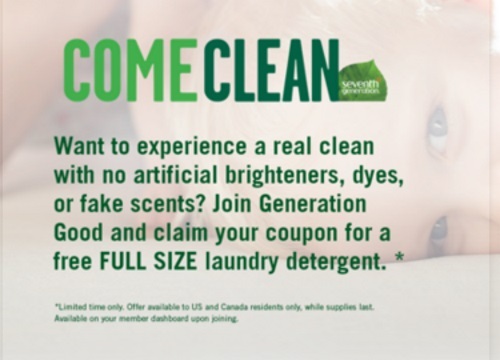 Sign up for Generation Good and receive a Free coupon for a Free Full Size Seventh Generation Laundry detergent ($14 US value). I found signing up with your social media is much faster (Twitter, Facebook etc). If you register by email you will have to wait for the confirmation email before you can log in. Once you've credited your account, click on the "Dashboard" near the top of the page, and under "Offers for you" there will be a #ComeClean coupon offer, accept that to claim your freebie! Limited time offer only. While supplies last. 1 per person. Allow 2 weeks for delivery. Click here for a list of what retailers sell Seventh Generation. Click here to get your Free Coupon. trying to register but nothing is happening when I press submit. anyone else having trouble on the Generation Good site? Check our Facebook page to where to get it, lots of readers posted where they found it. There's also a link in the post with participating retailers.